i3. Simple clean setup. I used dwm before, but I think i3 is way more simple to configure and has a few features I find nice. 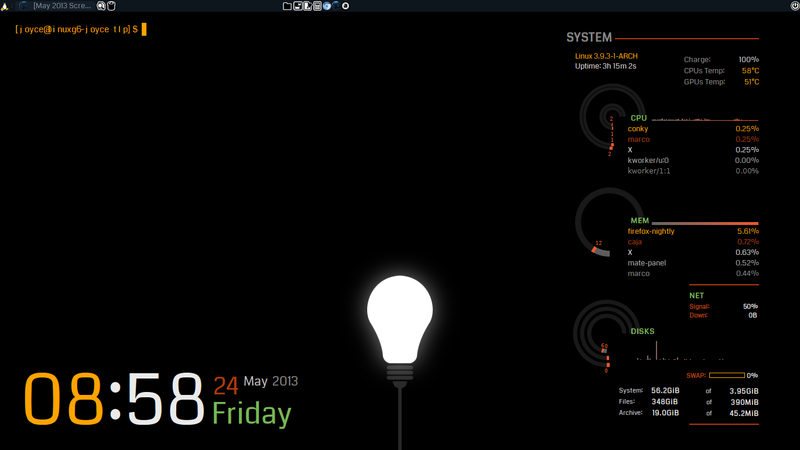 Trying out i3... clean/fakebusy. Open to criticism. What screen dimensions and resolution were you running again? 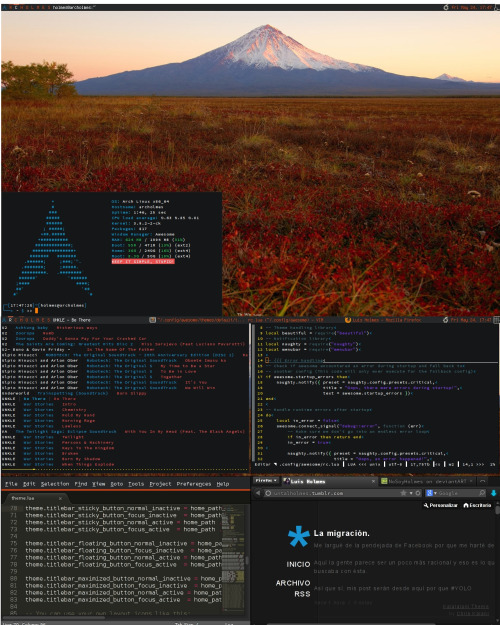 I'm using BE::Shell instead of plasma-desktop. My first ride on linux. I've been on windows since I was 9, which makes it 15 years. Just to note, it really isn't that hard to install arch like people complain. I've tried almost every single distro for the past two weeks; the thing is with some distros is that they give you an OS with few clicks on and then asks you to learn "compile your kernel" to change a font. Open SuSe was not bad too, like fake statements of Torvalds about the importance of the ease of use in an OS just to attract stupid people to GNU. Oh, that was a screenshot thread right! 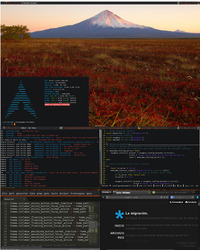 However, MATE with some customized conky themes, tilda, gtk2 themes and a wallpaper from google. Uhh, this image has a bad quality :c.
Love the colors! Can you share your configs? I know i have a mess, and again, sorry for my english and for don't know how to post here. 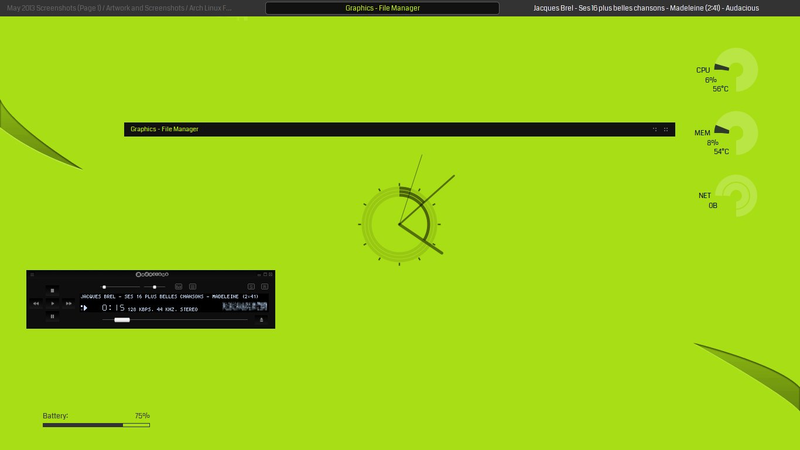 Spectrwm with urxvt and firefox. Next project is customising bash itself. That's not spectrwm's standard bar, is it? If so, can you share your spectrwm.conf and baraction.sh? The lefthand information about screen, workspace and current focus' class is rom the spectrwms standard bar, the rest is however not. I have made a script to display that information that is run as the baraction.sh file when spectrwm starts. Essentially spectrwm runs a script that parses info from conky into dzen2 and uses the same colors as the spectrwmbar it overlaps. If you're interested I have included my scripts below. with Foobar. If not, see http://www.gnu.org/licenses/.